(Nanowerk News) Cancer cells are notoriously good at becoming resistant to the drugs meant to kill them. One way they do this is by rerouting their signaling networks, specifically those responsible for the cell’s growth, proliferation, and survival. For example, doctors may give a drug to block a particular signaling pathway, but within a matter of days—and in some cases minutes—cancer cells begin to rely on an alternate pathway to promote their survival. To combat this, patients are often given multiple drugs, so-called rational combination therapy, in the hopes of attacking both primary and alternative pathways; the goal is to preemptively block the cancer cell’s escape route. Yet, controlling when more than one drug will enter a cell and how much of each will enter has been a significant challenge that has limited the efficacy of many combination therapies. The reason is that drugs often have very different chemical properties, which cause them to travel to different parts of the body and enter cancer cells at different rates. For example, drugs that are hydrophilic, or water-loving, tend to accumulate in tissues with high water content, whereas hydrophobic drugs, which are repelled by water, steer clear of these same areas. NIBIB-funded researcher Erik Dreaden, Ph.D., a postdoctoral fellow at the Massachusetts Institute of Technology (MIT), is hoping to solve this long-standing problem. Working in Paula Hammond’s lab at the Koch Institute of Integrative Cancer Research at MIT, Dreaden has developed a method for packaging more than one drug into a nanoparticle to allow them to be co-delivered into cancer cells. 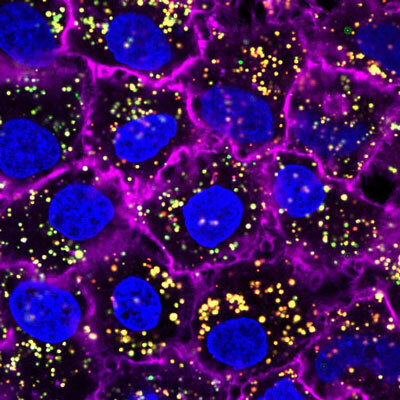 Layer-by-layer nanoparticles (yellow) targeting and entering cancer cells (blue). “We actually lock drugs into one container, so when cells pick them up, they not only get both drugs at the same time, but they get the ratio that we preprogram into the nanoparticle. That allows us to ask whether there are ratios that are most effective in terms of cell killing; once we determine that, we can translate those drug ratios into our particle to make the best use of our drugs,” says Dreaden. The container is called a layer-by-layer (LbL) nanoparticle, and it consists of three components: a core vesicle that is filled with water and has a fatty, double-layered membrane; a multilayered shell; and an exterior layer that targets the nanoparticle to cancer cells and prevents it from being detected by the immune system. The core vesicle is designed so that it can contain both hydrophilic and hydrophobic drugs. Hydrophilic drugs float freely in the vesicle’s watery core and hydrophobic drugs find their home in the vesicle’s fatty membrane. The drugs are able to be contained in the same particle because each is compartmentalized in its preferred chemical environment. The purpose of the multilayered shell is to stabilize the particles, prevent drug leakage, target the particles to the slightly acidic environment of the tumor, and to minimize the particle’s interactions with non-cancerous cells. The multilayered shell can also be used to transport drugs that are not easily stored in the core, such as highly charged nucleic acids. These molecules can be spread out within different layers of the shell so that they’re separated from drugs that can inactivate their therapeutic effects, for example, platinum drugs. The exterior layer contains molecules that further target the nanoparticle to cancer cells and help them pass through the body unnoticed by the immune system. Dreaden and colleagues recently tested one type of their nanoparticles to see if they could simultaneously block two cell signaling pathways—MAPK and PI3K—which are among the most frequently deregulated in human cancer and help the cancer to survive. Previously, a clinical trial involving 236 patients with advanced solid tumors found that the combination of MAPK and PI3K inhibitors was more effective at shrinking tumors than a MAPK or PI3K inhibitor alone ("The clinical effect of the dual-targeting strategy involving PI3K/AKT/mTOR and RAS/MEK/ERK pathways in patients with advanced cancer"). However, this increase in efficacy came at the expense of greater drug-induced toxicity and significant side effects. Dreaden hypothesized that LbL nanoparticles could further enhance efficacy of MAPK-PI3K combination therapy, while reducing toxicity and side effects. They would achieve this by more efficiently targeting the drugs to tumors, decreasing their contact with healthy tissues and ensuring their co-delivery into cancer cells. In the June 01 issue of the journal Clinical Cancer Research ("Tumor-Targeted Synergistic Blockade of MAPK and PI3K from a Layer-by-Layer Nanoparticle"), Dreaden and colleagues reported that mice that had triple negative breast cancer tumors implanted under their skin exhibited significant disease stabilization after 30 days following injection of LbL nanoparticles filled with MAPK and PI3K inhibitors. In contrast, dual administration of non-encapsulated PI3K and MAPK inhibitors—given at the same dose—caused rapid toxicity and eventually death. Dreaden says the next step for the LbL nanoparticles is to test them using a more challenging animal model of cancer in which tumors are located in their actual anatomical sites as opposed to being implanted under the skin. Additionally, he’s interested in whether LbL nanoparticles can be used to deliver multiple drugs that locally target the immune system, which is often compromised in cancer.